According to this report posted by Search Engine Land, several sources are reporting that Google is going to stop passing paid search keyword data to analytics, replacing it with the dreaded “not provided”. Now according to these sources, the keyword data will still be available in AdWords, so this will prevent a “PPC is dead!” over-reaction from the search community that occurred when the same thing happened to organic search terms. However, it got me thinking about the ramifications outside of soon-to-be inconvenient reporting for paid search specialists. 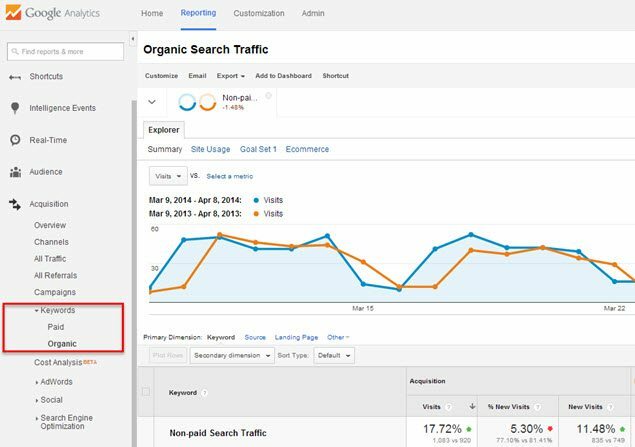 Two of the reports that I still find valuable (if a site has a long enough history in Google Analytics) are the Organic and Paid Keyword reports under the Acquisition menu. These reports house valuable historical (in the case of organic) and current (paid) data on search queries used to access your site. It has been speculated for a while that the Organic Keyword Report would be phased out by Google, especially with the shift to 100% secured searches from Google. I believe that Google has kept it around because they didn’t want their Paid Keyword Report to be lonely. Now with both channels providing no valuable data whatsoever, I envision these reports are on the fast track to be removed from our lives forever. “Why does that matter?” you ask. Well if you’re a brand new site or are just being introduced to Google Analytics, it does not mean a whole lot and you should focus your time on learning to unlock the valuable data that Google Analytics still provides. But for those of us who have been around long enough, it means losing all that precious historical data that can still be put to good use. And I don’t mean to get all Andy Rooney on you, but it’s like losing a part of your past, when you could turn to Google Analytics to find exactly which search terms were driving traffic, and you could use that data to improve your website. The nostalgic loss will be the most devastating (at least for me).